Welcome to our Fireplace Repairs page – Victorian Fireplaces Web Page. We not only sell Victorian Fireplaces and the Old Victorian Marble Mantelpieces, we are also experts in refurbishing and repairing Victorian fireplaces and their surrounds. We make Fireplace Mantlepieces from different materials each with their own styles and properties – incl. wood, marble and sandstone. We manufacture Wood Fireplaces, Marble Fireplaces, Sandstone Fireplaces, Open Fireplaces & Braai areas. We stock repair and maintain Victorian Fireplaces. Open-type fireplaces are built to order as well as Fire grates and Ironmongery. We have Firedogs, Old fashioned grates, and Victorian Fireplaces in stock and a showroom where you are able to view samples. We specialize in the manufacturing and customizing of Chimney Pots. Repair & Maintenance of Victorian Fireplaces. © 2019 Victorian Fireplaces. All rights reserved. Delicately crafted using Franz Josef theme and WordPress. VICTORIAN FIREPLACES - Fireplace Company in Cape Town specialising in Victorian and Antique Fireplaces. Walsh Fireplaces. Unique fireplaces designed and built. 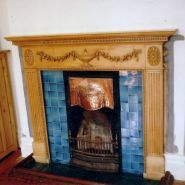 Victorian fireplaces restored and repaired. Fireplaces Cape Town.